Audience response to The Man From U.N.C.L.E. back in the ’60s – well, I was frankly surprised by the show’s success and the attendant publicity for David and myself. Compared to today’s salaries, our cut was minuscule but it was very good for the time. I was studying American politicians who were searching – allegedly – for American communists because it would put them on the front pages of the papers in their home towns. I’ve been obsessed with clothes since I was a little boy. I’m still very close friends with his first wife, Neile, who is now remarried. 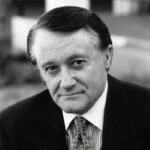 Robert Francis Vaughn is an Academy Award-nominated American actor noted for stage, film and television work. His best-known U.S. television series roles include the suave spy Napoleon Solo in the 1960s The Man from U.N.C.L.E. and wealthy detective Harry Rule in the 1970s in The Protectors.